The college currently has more than 200 associate degree, technical diploma, certificate, and apprentice programs in six academic schools: Business; Media and Creative Arts; Health Sciences; Liberal Arts and Sciences; Technology and Applied Sciences; and Pre-College Education. It served more than 38,000 students in 2014, and more than 85% of 2014 graduates were employed within six months or had continued in four-year educational institutions. Each of the college’s four campuses offers day, evening, and weekend classes. In addition to campus-centered classes, MATC faculty members provide basic skills instruction to dozens of community-based organizations. The college had 1,250 full-time faculty and staff in 2014-15. New academic programs are developed each year to meet regional workforce needs, including early childcare education, emergency medical services, truck driving, digital media, and information technology. The MATC Education Center in Walker’s Square added appliance technician, preparatory plumbing, and bricklaying technical diplomas to satisfy employer and resident demands. The institution has expanded its partnerships with four-year colleges and universities to offer more articulation agreements, giving MATC students additional options for earning associate degrees and transferring the credits to complete a bachelor’s degree. The college is collaborating with Milwaukee Public Schools and the University of Wisconsin-Milwaukee, forming the M3 Initiative that is dedicated to achieving student success in Milwaukee schools from kindergarten through college. At the turn of the century in 1900, a struggling economy resulted in thousands of children dropping out of school to earn a bit of money to help support their families, but many of these boys and girls were being shortchanged in the bargain. They found low-paying jobs that required no skills, only an ability to perform repetitive operations with machinery and hand tools that were quickly mastered but provided no ladder to improve. These unskilled laborers, ages 14 to 18 years old, were the forgotten group in the educational system. In the marketplace, they were an important source of cheap labor and contributed to the economy of their time. But how would these children be able to grow up and earn a living to support a family of their own without education? A social activist by the name of Charles R. McCarthy offered a solution. Why not create a school that would allow these young people a second chance to complete their educations and improve their lot? Nothing like this kind of school existed anywhere. But McCarthy was an influential and forceful speaker and discussed the plight of the untutored with associates and state legislators. He sold the idea and is now recognized as the father of the “continuation school” which many years later led to development of the technical college system in Wisconsin. The Wisconsin Vocational Education Act of 1911 was one of the most far-reaching engines of change, creating a statewide network of continuation schools. The new law required employers to release teenage boys and girls from work to attend school or learn a vocation. Apprentices, who could be “indentured” then with as little as a third grade education, were also granted the right to attend school. 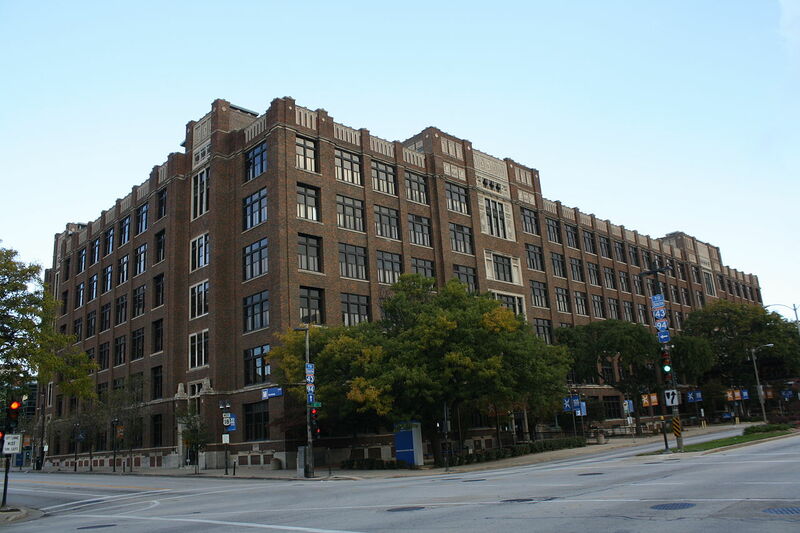 In 1912, the Milwaukee Continuation School, led by founding director Robert L. Cooley, began classes at Mason and Water streets in the Manufacturers’ Home Building (for the girls) and in the Stroh Building on the banks of the Milwaukee River (for the boys). Cooley received a $5,000 budget from city leaders to launch the school, and they gave the director a desk in a City Hall corridor. Soon overcrowded, these makeshift classrooms were replaced by city leaders with a building at Sixth and State streets, still the site of MATC’s “Old Main.” The first section opened in 1920. Consolidation of classes took eight more years, until 1928. When completed, the new school was called Milwaukee Vocational School, reflecting its educational mission. Cooley led the institution in the direction it would take for the next century, using up-to-date equipment students would encounter in the workplace, with curriculums developed and taught by professionals in their fields—“practical learning.” From the earliest days, evening classes were offered, with branch evening schools serving people from many different backgrounds. It began and remains today an open enrollment institution. Over the years, MATC has been a vibrant educational asset for Milwaukee, changing and adapting to its students’ needs, to the demands of business and industry, and even to world developments. The Great Depression, for instance, caused Milwaukeeans who lacked jobs to flock to the Milwaukee Vocational and Adult School (MVAS) for retraining. Whenever the economy contracts, student numbers mushroom as people prepare for new opportunities. The greatest catalyst for change at MVAS was World War II. The need for war production worker training brought many to the school. MVAS operated 24 hours a day. Curriculum changes were altered to fit the needs of wartime industry. Adult women and African-American student enrollment numbers climbed. After the war, Milwaukee war veterans filled MVAS classrooms to use their new GI Bill educational benefits to retrain. Many women, who had found new employment opportunities during the war, were now eager to join the regular workforce and entered MVAS programs for job training. Displaced persons from countries across war-ravaged Europe arrived in Milwaukee, requiring English as a Second Language and basic skills education. The curriculum changed too, as military technologies eventually led to computers and digital technologies. What was becoming clear as the 1950s moved into the 1960s was that the institution was now serving the needs of far more adults than children. It was transforming into what it would be: an accredited two-year technical college. The new Milwaukee Institute of Technology Division developed the first associate degree program, Technical Engineering, in 1959, and many more programs would quickly follow. In 1968 the Wisconsin Vocational, Technical, and Adult Education system was created and the Milwaukee Technical College District was formed. The institution’s name was changed to Milwaukee Area Technical College in 1970 to better reflect its service area. The Mequon and Oak Creek campuses were built in 1976, while the downtown Milwaukee and West Allis Campuses were expanded and renovated. MATC has also been a leader in sustainability and green technologies. The college has a 32-acre East Side energy-producing site (believed to be the first of its kind in the U.S.) to operate electric vehicles and Milwaukee Public Television’s stations. Its Center for Energy Conservation and Advanced Manufacturing at the Oak Creek Campus and its Mequon Campus’s wind turbine, largest on a college campus in the state, are further advances. Today, MATC serves nearly 40,000 students annually and is the state’s largest minority-majority higher education institution. ^ Robert W. Tarbell, A History of the Milwaukee Vocational and Adult Schools from 1912 to 1958 (Milwaukee: MVAS Press, 1958), 191. ^ “The MATC Story,” MATC News, 1, accessed May 19, 2016. ^ “The MATC Story,” 5. ^ Correspondence from Kathleen Hohl, MATC Communication and Events Director, May 10, 2016. ^ “Reformist Roots,” MATC News, 3, accessed May 19, 2016. ^ Tarbell, A History of the Milwaukee Vocational and Adult School, 31. ^ “Easy Access and Online Learning,” MATC News, 2, accessed May 19, 2016. ^ Tom Gould and Mary Anne Gross, eds., Centennial Stories (Milwaukee: MATC Printing Services, 2011), 14-17. ^ “Milwaukee Institute of Technology,” MATC News, 4, accessed May 19, 2016. ^ Gould and Gross, Centennial Stories, 4-5. ^ “Prepared for Bright Futures,” MATC News, 2, accessed May 19, 2016. Gould, Tom, and Mary Anne Gross, eds. Centennial Stories. Milwaukee: MATC Printing Services, 2011. Tarbell, Robert W. A History of the Milwaukee Vocational and Adult Schools from 1912 to 1958. Milwaukee: MVAS Press, 1958.